Water quality crises consumed Florida this summer, so it comes as little surprise they surfaced in the Senate debate yesterday between Sen. Bill Nelson (D) and the man who wants to replace him, Gov. Rick Scott (R). The event was fierce and at times nasty, with accusations of lying and misconduct flying thick and fast. The race, which is shaping up as one of the most expensive Senate races ever, could very well decide the majority party in the chamber. Democrats need to hold the seat if they have any chance of taking control back from the GOP. On stage, Nelson called Scott a habitual liar, while the governor called the incumbent, who seeks a fourth term, a Washington insider with few accomplishments. Twin water issues afflicted Florida this summer: the red tide off the southwest coast that killed hundreds of thousands of fish and left manatees, turtles and dolphins dead on beaches; and the blue-green algal bloom in Lake Okeechobee that made its way to the Gulf Coast, where it coated beaches and coastal communities. Nelson and his environmental allies blame Scott for the water issues, pointing out that the governor cut hundreds of millions of dollars from the state water management agency. Scott's pro-business ethos made him a strong ally of agriculture industries, which scientists blame for nutrient-rich runoff that cause the now-yearly algal blooms. Scott contended, as he has in campaign ads, that Nelson and the federal government are to blame for failing to fund necessary repairs in Lake Okeechobee. "Senator Nelson has got no money to fix the dike at Lake Okeechobee. Zero dollars," Scott said. Campaign ads were at the heart of a bitter exchange between the two. 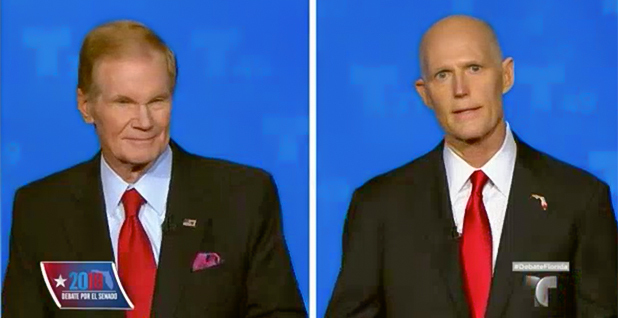 Nelson said Scott's ads have repeatedly been labeled false by fact-checking groups such as PolitiFact and Florida newspapers. "The governor keeps coming up with one whopper after another. Apparently you never got your mouth washed out with soap for telling a lie," Nelson said. Scott called PolitiFact "part of the Democratic Party." Florida's race for governor is also featuring fights over the algal blooms. Each side has put out ads promising to fight pollution (see related story). Other debate topics included health care — Scott rejected a Medicaid expansion — gun control and Brett Kavanaugh. Nelson plans to vote against his confirmation, while Scott supports the judge. Much of the debate, which was hosted by the Spanish-language network Telemundo, centered on immigration, Cuba, the situation in Venezuela and the aftermath of Hurricane Maria's devastation of Puerto Rico. Both candidates have played up their storm response. Scott has made solid inroads among Spanish-speaking voters for a Republican. He said he has made eight visits to the island since the storm and noted his administration's policies to help displaced Puerto Ricans — a significant Florida voting demographic. These include making it easier for Puerto Ricans in Florida to enter school and get in-state college tuition waivers. Scott was hailed for his energetic response to the storm when it hit Florida, though Nelson and others criticized him for refusing to link intensifying storms to warming oceans and climate change. Still, the disaster response remains a high point for Scott, and he showcased it during the debate. Nelson, who pointed out that island Gov. Ricardo Rosselló (D) endorsed him Monday, tried to link Scott to President Trump. The administration's storm response was widely criticized as deficient, and Trump himself has been dismissive of the disaster. Trump "has treated Puerto Rico and its people as second-class citizens," Nelson said, adding "everybody knows" the storm response was "terrible." Trump pushed Scott to run, and the president's allies and linked outside spending groups are among the governor's top donors. But Scott has stayed largely mum on Trump thus far during the campaign, particularly regarding Puerto Rico. He did not mention the president on stage last night. The candidates will debate again on Oct. 16.